After a million miles of motorcycling, you’d think I would know how to ride in the rain. It was only going to be a 250-mile ride over two days. The weather report mentioned a storm blowing in from the coast, but after a warm and dry summer I was lulled into complacency. About an hour from the start we smashed into the approaching storm front. Torrential rain was coming down in buckets and blowing sideways. The air was filled with blowing leaves. Tree branches were snapping off and blowing across the road. The pavement was quickly coated with layers of slippery leaves. It didn’t take long for me to realize that I wasn’t prepared for serious rain. Let me share with you several secrets that I should have remembered. Riding in soggy gear is a bigger deal than just feeling miserable. Riding soggy is an invitation to hypothermia. At highway speeds, the evaporative cooling of wet riding gear can quickly chill you to the core, and your thinking and muscle control will be slower. Staying dry and warm is a big part of keeping your brain and muscles functioning. One reliable approach to weatherproof riding gear is a fabric shell with a breathable membrane bonded to the inside. It’s very helpful to have a removable insulated liner. An electric liner or vest can provide additional heat. Waterproof glove and boot covers help keep your hands and feet dry, and don’t take up much space to pack. If you’ve been wearing open weave or mesh gear for summer rides, remember to bring along your waterproofs-- either an insulated waterproof liner to wear under the shell, or separate raingear to wear over the shell. After my bike did the moon-walk through a puddle filled with slippery leaves, I started reading the surface more carefully. The secret is that clean wet pavement has something like 80% of the friction of clean dry pavement. 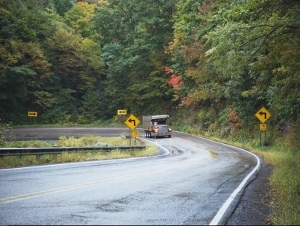 It’s those slippery areas you need to avoid—like those wet leaves in the puddle, or a dribble of diesel oil, or a slippery white arrow glued to the surface. Wet pavement can have surprisingly good traction where it’s not contaminated with slippery stuff. 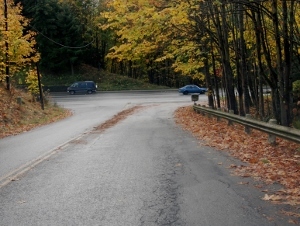 Keep your tires away from the center of the lane where trucks tend to drip oil, and out of the wet leaves. You can assume that painted or plastic lines and markings will be slick, including crosswalks and directional arrows. Brick surfaces will be slick when wet. Railroad or streetcar crossings will be slippery, especially the plastic or wooden aprons on both sides of the shiny rails. 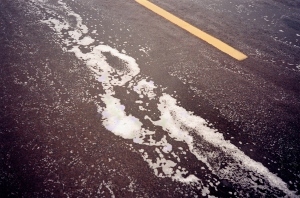 Oil and grease on the pavement will cause water to bead or streak, and may have a rainbow sheen. When you see a change in the color or texture of the surface, ride more conservatively until you can feel what’s happening. The key to avoiding a slideout on a wet surface is to make all control inputs smooth. To maintain steady front tire traction when approaching a curve, transition smoothly from throttle to brake, and then ease off the brake as you lean in. As you lean the bike in, smoothly sneak on the throttle as you steer into the curve, to help balance traction between front and rear tires. An "outside-inside-outside” line will maximize the radius of turn and minimize slip. Even if you feel your tires let go for a moment, avoid that sudden disastrous instinct to snap off the throttle or jam on the brakes. If the bike can recover, it will. When approaching a situation where you must decelerate, brake early. It’s difficult to comprehend how much braking force can be applied on the wet surface. Braking early gets the bike slowed sooner and more gradually, reducing the need to suddenly brake harder toward the end of the stop. To give yourself more time for evasive maneuvers, drop back farther behind other vehicles. Minimum following distance in the rain should be 4 seconds. When approaching a situation where you’ll need to slow down, it’s better to brake early, just in case the surface turns out to be slipperier than you predict. High-mileage commercial vehicles tend to dribble engine oil, grease and diesel fuel on the surface. A little moisture mixed with those contaminants can create a slippery goo that really reduces traction. That’s why the road seems so treacherous after just a light rain or morning dew. It takes about a half hour of steady downpour to wash the pavement clean. 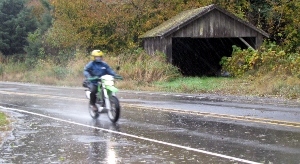 The clever rider takes a half hour break when it first starts to rain, both to avoid sliding out, and to avoid collisions with less-than-astute drivers. When it first starts to rain, you can often see the slippery goo floating away. A motorcyclist is very much exposed to lightning. A motorcycle’s rubber tires won’t insulate it from the pavement. Lightning is so high voltage that it can travel on the surface of objects, including rubber. Enclosed vehicles such as automobiles and airplanes are seldom penetrated by lightning strikes. A motorcyclist is exposed to serious injury. If you are caught in a mountainous area during an afternoon thunderstorm, the best tactic is to get inside a building until the lightning passes. If there’s no building available and strikes are getting closer (the thunderclap is less than three seconds after the flash) avoid standing under a tree. Get off the bike and lay down in a low ditch.